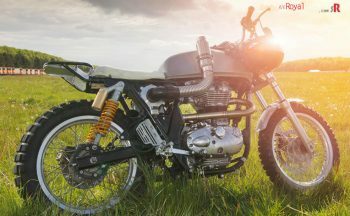 Royal Enfield Lightening 535 was once one of the powerful bike of from Royal Enfield stable, today 535cc engine is still most powerful in Royal Enfield but in its new avatar which we can find in Continental GT. 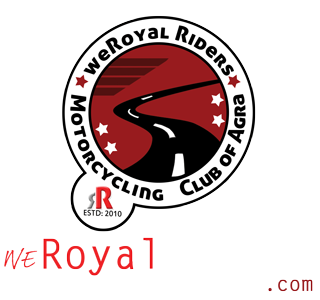 However, today the bike we are featuring is from Doaba Region of Punjab, it is developed by a father-son duo based on Royal Enfield Lightening 535. This bike is their first official custom and it seems they have done it well. 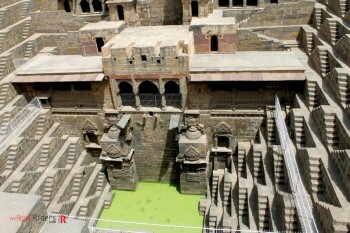 They have named it “Panj so Penti” which is Punjabi language for 535. 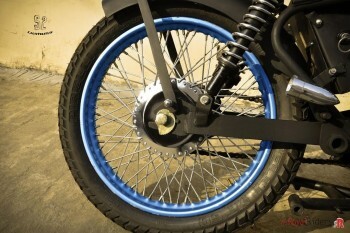 The major modification work includes Pirelli tires with attractive 72 spoke rims. 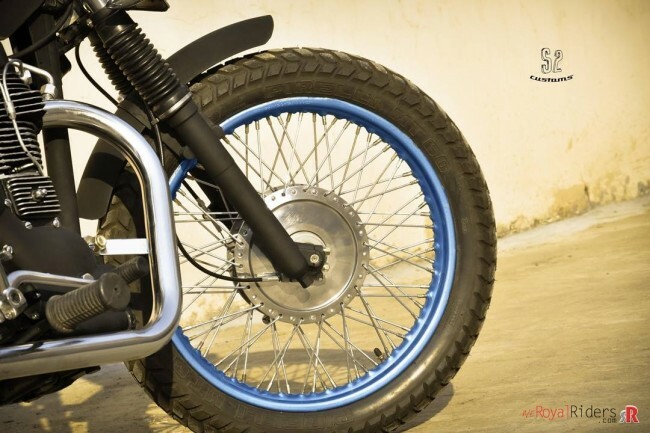 At the front this Royal Enfield custom features a one-off handlebar, custom headlight, a pair of LED turn signal indicators, and a single saddle seat and lot more which we will discuss further. Panj de Penti from S2 Customs. 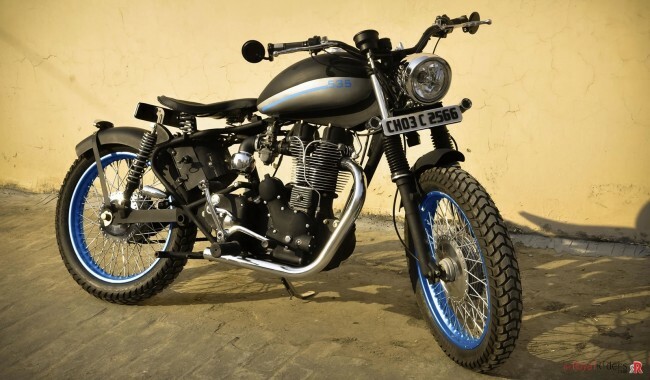 On first look it is clean, sober and nicely crafted bobber with a delicate and light visuals. The matt finish black color is a treat as it gives a substance to the bike. Though builder ie. 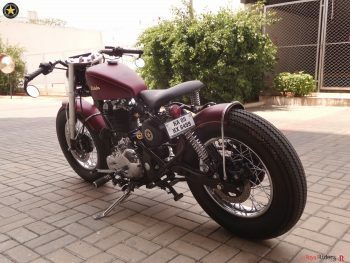 Manmeet Singh calls it a Street Tracker but bobber will suit it well too. 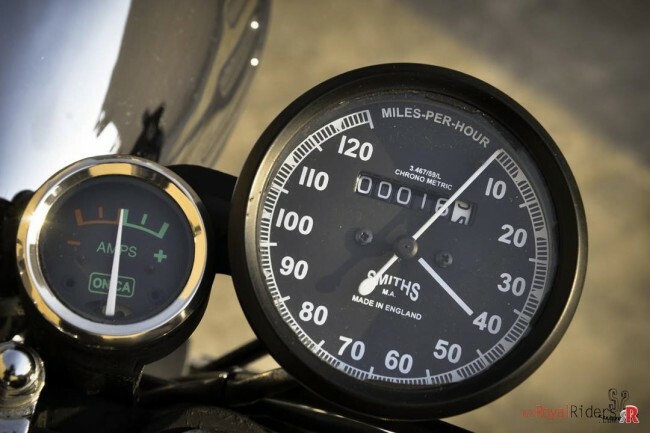 Made in England Royal Enfield Speedometer. The speedometer is retro and appears to be sourced from England with miles per hour reading. The speedometer also boasts black matt finish however, the AMPS meter has chrome coated dial. The instrument cluster looks retro and impressive. Performance Air filter has been used. 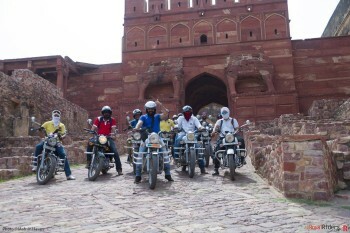 As per Manmeet it took them about 2 months to complete this bike as it is their first custom build motorcycle. 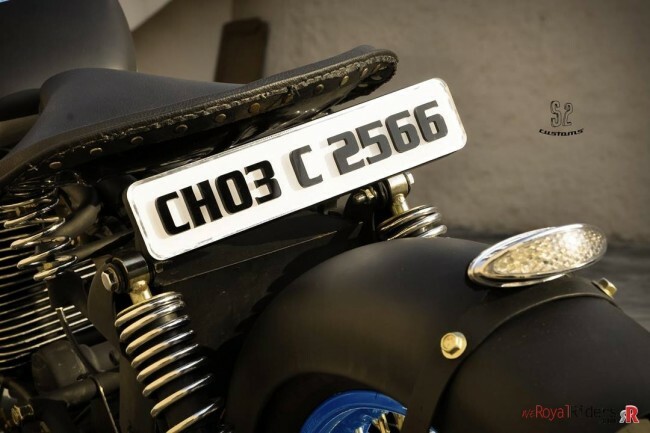 They took stock 535 Royal Enfield lightening, conceptualized and rendered it. The team which made it possible involved was a fabricator/metal worker, a mechanic to take care of the mechanical work and rest of the work was done by Manmmeet like the visualization of the bike from the fabrication to the paint job to the final renderings. All black matt finish has been used on engine with little touch of chrome. Other highight of bike is its rear LED taillight, the rear number plate mounted just behind Saddle seat looks fascinating, its like minimal yet useful setup. 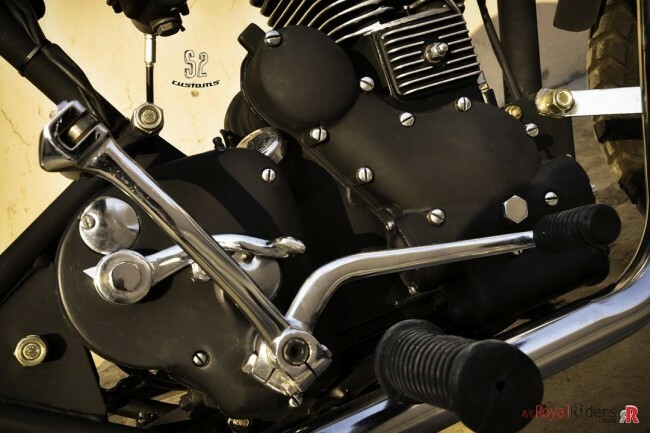 When asked about reason to foray into custom build motorcycle business, Manmeet tells us “Born and raised in the Doaba region of Punjab (Jalandhar), this is my first project and I teamed up with my dad. 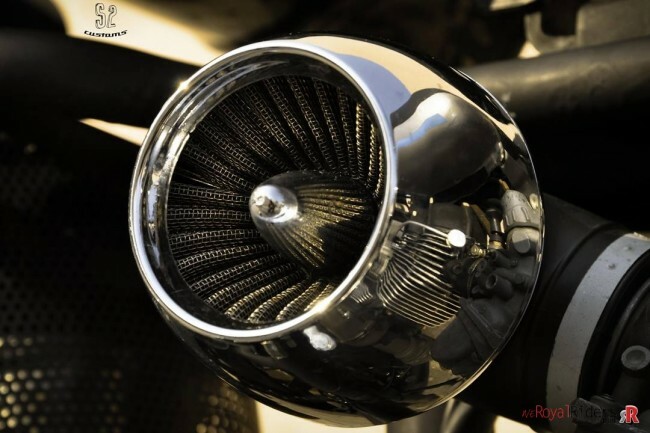 We had been discussing machines ever since I was a kid and one day we decided to start up a custom motorcycle shop. We started the shop to beat up the metal hard enough to hear the thump out of it.”. He says that now he will build more motorcycle for customers as well as for his creative satisfaction. 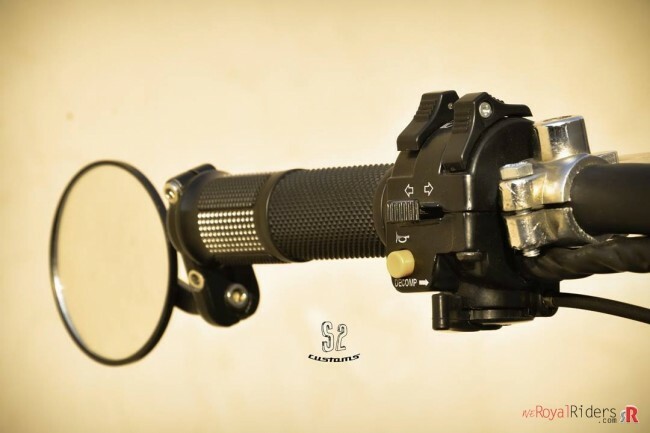 Custom LED tail light for Royal Enfield. Though Manmeet Singh had worked for various T.V. and movie projects, he now plans to pursue his teen age dream of custom build motorcycles. Definitely his experience will help visualization and rendering of future concept bikes. We are looking forward for his more work and further creations. If you want to get in touch with Manmeet then you can find them on their Facebook page. Do let us know what you do you feel about thie bike, your comments and feedbacks are appreciated as always.